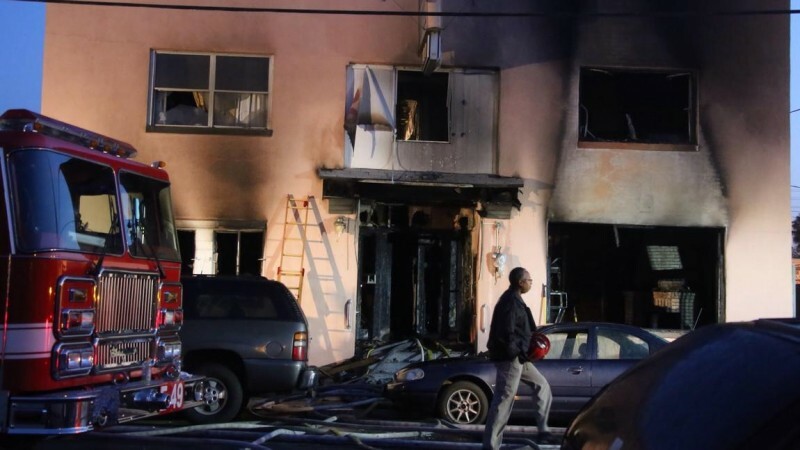 Suspicious Wilmington Motel Fires leaves 1 dead And 15 people Injured. People were forced to jumped out of windows because they were trapped in their motel rooms. 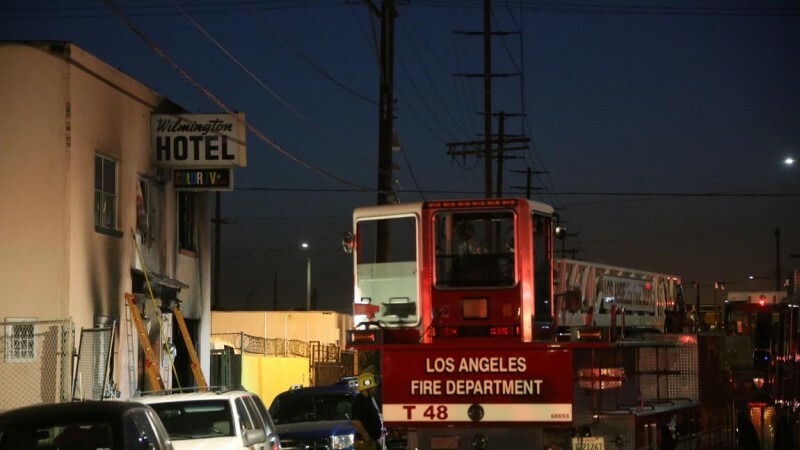 “suspicious,” broke out at the Wilmington Motel located at111 E. C St. (map) shortly before 3:15 a.m. and burned for nearly an hour before crews were able to knock it down, according to the Los Angeles Fire Department. Residents described a chaotic scene when the fire erupted, including multiple people jumping from windows to get out of the 20-unit building. “People were just jumping out of their windows and screaming and yelling,” said a female resident named Diana. Although LAFD reported that the building’s smoke alarms were working at the time, some residents said they didn’t hear the warning system. One resident, who identified himself as Rodney, did not hear the alarm but went to his door after hearing a commotion in the hallway that he said sounded like people fighting. Rodney only realized the building was on fire after he smelled something burning, opened his front door and saw the hallway filled with thick smoke. “After that, as we came out, there were people jumping out of the windows. They asked us to catch a little girl so we caught a little girl that was jumping out of the window. They dropped her down to us,” Manuel said.Another resident, Manuel, said he heard the alarm but initially though it was his refrigerator. He said he ran out of his room after people banged on his door. He added that the girl’s grandmother then jumped and they caught her too, but she broke her ankle in the fall. Another man made it out from the window on his own, Manuel added. Some residents complained it took firefighters too long to get to the motel. “It took them an hour to get here,” Rodney said. Diana also expressed frustration over their response. “It took them a long time, and even when they got here they were just standing out in the front … it was getting really bad,” she said. But according to LAFD Deputy Chief Daren Palacios, firefighters responded to the scene exactly three minutes after dispatchers received a 911 call reporting the blaze. It took 100 firefighters a total of 50 minutes to extinguish the blaze, according to LAFD.Crews were then hindered in their efforts to fight the flames by several obstacles, including a fence that became electrified by a live wire and bars on the windows of the lower units that had to be cut off with chainsaws, Palacios said. One person, identified an adult male, died in the fire. His name has not been released. Fifteen people were injured in the blaze, including some who escaped the flames by leaping out of the building, according to LAFD. Of the injured, two had moderate to serious injuries while 10 had minor injuries. They were taken to an area hospital for treatment, while three others with injuries declined to be transported. At the time of the fire, 29 people were staying in the building. 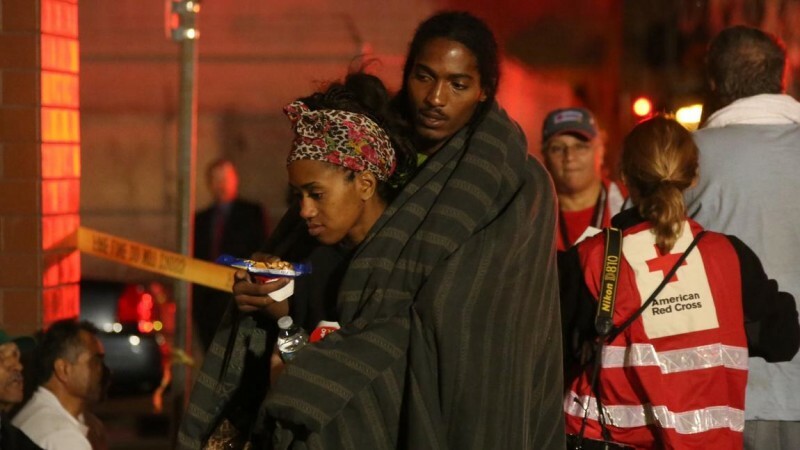 The displaced residents were being assisted by LAFD, Red Council and Los Angeles City Councilman Joe Buscaino, LAFD said. Arson investigators were working to determine the cause of the fire, which remained unknown Thursday morning.